As a general rule, garbage time is unfun to watch—just a bunch of guys scrimmaging out in the public sphere, the actual game long reduced to a formality. The large exception to that rule is named Boban. There will never be a time when 7-foot-3 center Boban Marjanovic is on a basketball court and doesn’t bring a better experience. 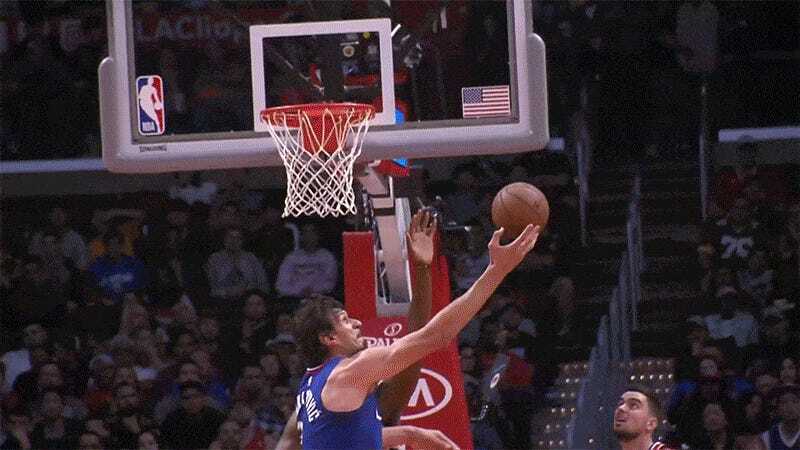 With the Clippers’ 136-104 win over the Wizards basically secure after three quarters, big Boban came in for the fourth to rack up 13 points, nine rebounds, and two blocks on just seven field goal attempts, including the vicious and-one seen above. In classic Boban fashion, he’s now leading the NBA in PER. And the one field goal he missed? A three-point attempt, his first of his season, beating Ben Simmons to the mark. Before you stands a true stretch-five in the making. Bless you, Boban, and your economical highlight reels.